Apologies for being late, but well Easter and all its jollies got in the way of writing, so here is the holiday edition of Friday Fun. Please send me your details and I'll get your prize out to you. In my world, we're in the process of organising some fairly major work on our home. It's exciting, scary, daunting and everything else in between. I feel like I'm somewhere between Grand Designs and Bob the Builder. 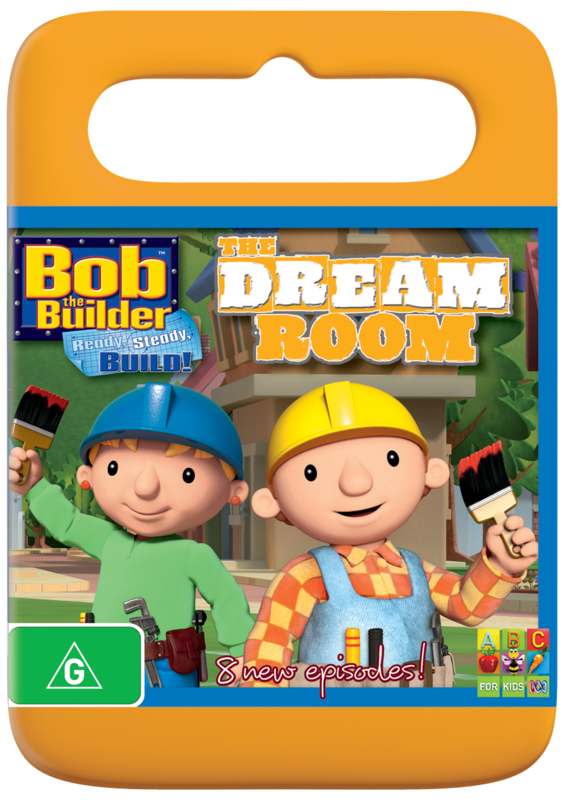 In fact, I often have the Bob the Builder theme song floating round my head as I look at plans for my new sanctuary, so it seems apt to give away 5 copies of the latest DVD - Bob the Builder The Dream Room. Entries close 11.59pm, Thursday 12 April 2012. Open to Aussie residents only. a built in coffee machine in my new kitchen. The new kitchen is on its way this week (yay!) but not the coffee machine, couldn't quite justify it! a lock on the door!!!! We are about to renovate our bathroom and it would be my dream room if it contained a bath tub that I could actually fit into at full stretch. have set rooms that are designed for children to enjoy - and then have the rest of the house 'toy free zones'!. A mini fridge, so I could keep snacks and drinks for when I'm watching a movie! A Quiet Room... soundproofed against whining kids and nagging hubbies! Oooo how exciting! Thank you thank you Corinne, what a great end to a great long weekend! I am actually wanting to make our kitchen my dream room... I can achieve this by creating more cupboards and more bench space and maybe some fancy schmancy lighting. Oh wow, that's SO exciting! We're hoping to knock down our house and rebuild in a few years, so I can imagine how you must feel. Scary and exciting at the same time! I've always fantasied about my dream kitchen - I'm thinking a kitchen with a walk-in pantry and lots and lots of storage. So I don't have to store pots and cutlery in my wardrobe... And so that I can actually have lovely sets of wine glasses at the ready, not have to dig them up from a box in my room. First world probs, but such a pain! I've definitely fantasised about my dream bedroom - big enough to have bed etc down one end, but at the other end would be a beautiful sitting area. There would be a fireplace with two big cosy chairs. There would be soft blankets, lamps and no children would be allowed. It would be where I would retreat from the world and just sit and read. Windows, windows, windows or gorgeous bright lighting. The right light can make a simple room magnificent! Soundproof walls so when you just need to be in peace and quiet for 5 minutes you can give yourself some time out from the demanding kids. a magazine rack beside the spa and a bar fridge for the icy cold drinks which will be sipped throughout the night! Soundproofing; great when you need to vent after a hard day with tantrumy children - and even better when you need to let them 'cry it out' in their cots. There may also (see - definately) be a secret refridgerated cupboard for wine for those extra bad days. I always dreamed of a secret room, a hidden doorway that led to a secret quiet spot, with a sunny position for reading and a comfy lounge for naps! In reality though I dream of storage, lots and lots of big storage. We only have small cupboards, pokey cupboards and I long to have proper storage space. I make do with IKEA, but dream of built ins and shelving! A room where all the furniture and walls haven't been destroyed by kids and dogs! A secret Mummy room with a couch, bookshelves and a table for the sewing machine. A retreat for me where no one else is allowed to go. Something natural such as an indoor plant or an aquarium, it creates a soothing yet refreshing ambience. I'd have a skylight in my dream room, and ten foot ceilings. Nothing gives life and energy like natural light! My dream room has no toys on the floor ;) and one wall that has a screen which is backlit and can change colour/image when the mood takes me, similar to some restaurants. I would have a 'dream parents retreat' - with comfy sofas and lots of cushions - a place to 'hang out' away from everything and everyone. A time machine so at I transport myself back to a time when I had loads of energy, time and money, pre baby body and my biggest resonsibility was to feed the cat at night! A peaceful quiet room where you can chill out for a few minutes or longer everyday.....good for the soul! What do you call an Easter Grinch?